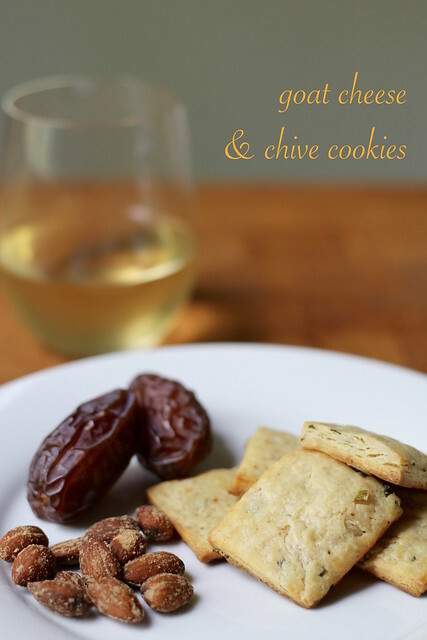 These Goat Cheese and Chive Cookies are part of Dorie’s special “cocktail cookies” collection…little savory bites to pair with drinks. I went with white wine, but Dorie says they are great with Prosecco. Maybe I’ll give that a try with the rest of the dough still in the freezer. These are roll-out cookies, and I definitely rolled mine a little thinner than I should have, but you can see that they have flaky-biscuit like layers. They aren’t super-crisp cookies, but that means you can hold a glass of wine in one hand and a cookie in the other and not have them crumble all over your shirt while you snack and mingle (and maybe dance around the backyard like a dork!). For the recipe, see Dorie’s Cookies by Dorie Greenspan. It is also Dorie’s #cookiesandkindness selection for the month of May, so you can find the recipe on her site, too. Don’t forget to check out the rest of the TWD Blogroll and please join us if you haven’t already! Your cookies look so elegant in the way they are presented. I guess I was expecting crisp cookies, so hence my disappointment. “that means you can hold a glass of wine in one hand and a cookie in the other and not have them crumble all over your shirt while you snack and mingle” << THIS! So important in a cocktail cookie! I echo what Mardi said, as the need for dancing around your backyard like a dork, something I need to do daily! I like the shape you cut the cookies. So pretty. The fruit and nuts pairings look so good. A non crumbling cookie is an important consideration when mingling or dancing. Oh, these would be quite perfect with apero tonight! I love anything with cheese, and these look like a perfect match to wine! I made these cookies this past weekend and they were a hit with the family.